Hyun Jong Won. 2011 - 2019. All rights reserved. 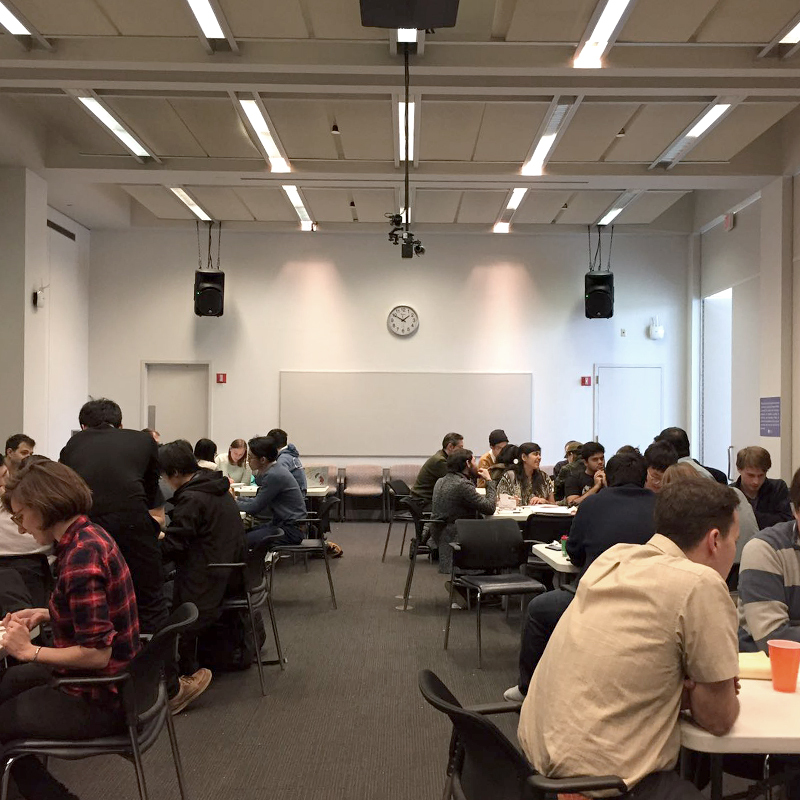 -To create a socially engaging, competitive role-playing board game fit for teenagers / young adults audience. 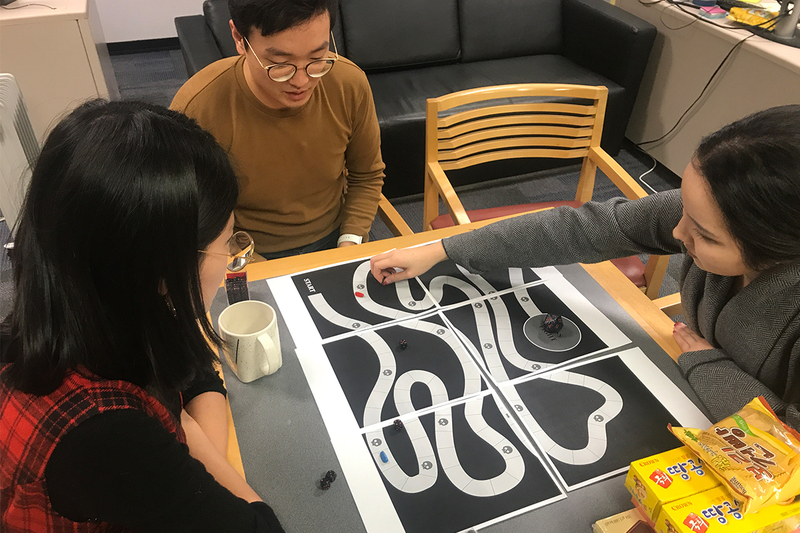 Using a pair (or more) of dices for movement and attack, the game gives the player an impression of strategy by giving them choices within the condition generated by the random values. 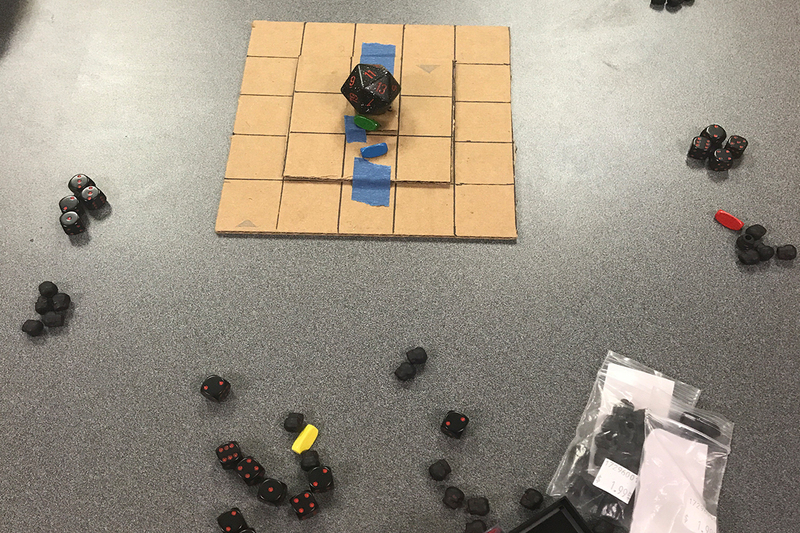 Flicking dice to knock off others’ off the battle arena. Improv Roleplaying game with dice. Detective, clue-like game with dice. -Each player would take turns to make their moves. -Each player would start off with 1 die, the minimum number a player can have is 1, and maximum is 5. -The total sum of the dice throw would be the maximum number of tiles the player can move. 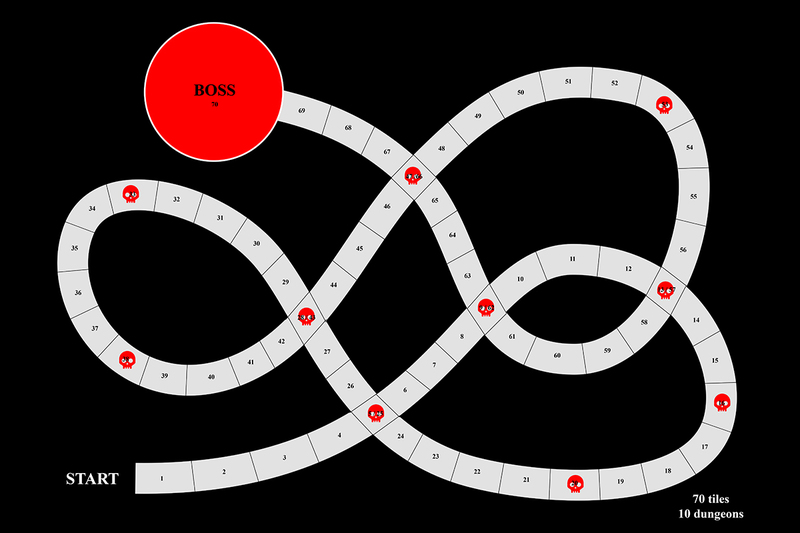 The player may choose anything in between or not move at all. -The dungeon tiles are marked with a skull. Once the player is in the dungeon tile, the player must confront a monster. The player first rolls one of his die, and then the monster rolls its die. If the player rolls the higher number, he/she gains a die. If the player rolls the lower number, he/she is sent back to the starting point. If there is a draw, they must roll again. -When two players are within the same tile, they must fight. Both players roll a die, and whoever rolls the higher number wins. The loser is sent back to the starting point. -At the boss fight, the player rolls all of his/her dice, the sum of which is compared to the boss monster’s die. If the player has the higher number, he/she wins the game. If he/she has the lower number, he/she is sent back to the starting point. If it’s a draw, do it again. -Instead of fighting monsters, Victoria chose to move forward most of the time. -Sally chose to take a lot of risks and fought monsters. She lost often and was sent back. She pointed out a loophole in the game where the player can farm the first few dungeons to gain more die as soon as possible, with little consequence due to their proximity to the starting point. -Due to the difference in each player’s objective, there soon rose a big gap in tile progress between Victoria and us. -I was encouraged by Victoria to fight the monsters more frequently, both of which have resulted in losses and had me sent back to the starting point. -There was a change in the monster duels. 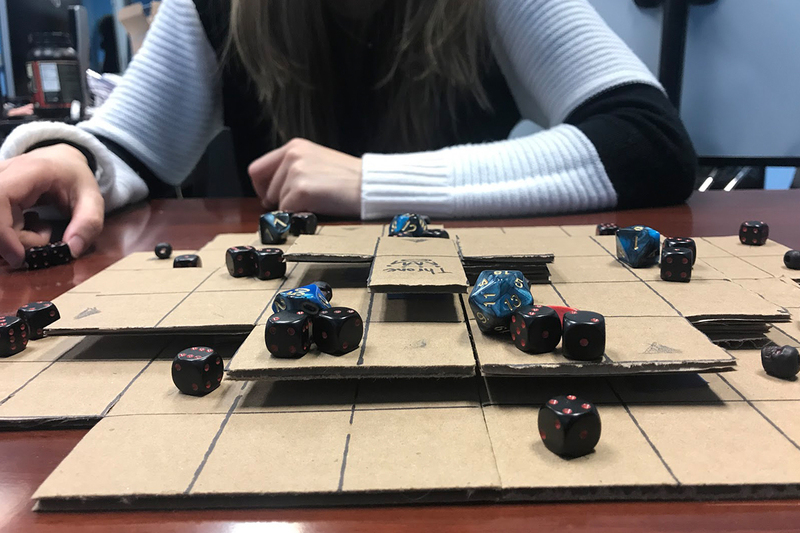 Instead of the current player rolling the die twice, one for the monster and one for him/herself, one of the other players took on the role of the monster, rolling in its place. This added a dramatic effect, causing tension between the players especially if the current player lost to the monster. -When Victoria had reached the Boss, I rolled in its place. I rolled a 17, and Victoria’s sum was 14. She was infuriated in response, as she was sent back to the starting point. -There needs to be more moments of interaction between the players – the battle between players isn’t frequent enough as of now. Allow them to intervene in certain cases? =balancing the players’ punishment for intervening. -Introduce puzzle elements to give diversity to the gameplay? -Perhaps make a variety of monsters / adjust their difficulty? -Make other players play the role of monsters? -The map was too long; it often felt tedious to walk all the way back, just to be sent back again. -Shorter, intersecting path to minimize the total movement time + create more moments of interaction between players. -If the player rolls a sum of 13, then the must give away one of his dice to an another player of his/her choice. -When the player has more than 2 dice, if the player rolls a double with 6, then the player loses all of his/her dice except for one. -When the player has more than 2 dice, if the player rolls a double with 4, then the player “dies” and is sent back to the starting point. -A player may choose to summon a player of his/her choice to his/her current tile, at the expense of one die. -A player may give up one of his/her dice to play in favour of the monster against the current player if he/she chooses to do so. -In the boss fight, the player may use all of his/her dice, a sum of which is compared to the monster’s dice. If the player has the higher number, he/she wins the game. If the player has the lower number, he/she dies, sent back to the starting point, and must wait for 2 turns. If there is a draw, they must roll again. -Player may choose to team up for the final boss battle, in this case, the players can combine their dice. Same rules apply. -add more diversity to the encounter -> the player rolls the dice to decide? -make movement contained to one die -> restricts movement. -Allow cooperative combat system, where players can team up against monsters and amongst themselves. -The players can wander off in whichever direction they may choose. -Allocate multiple weaker, common monsters near the road intersections and the special, stronger monsters on the outskirt roads. -Incorporate special, exclusive dice to certain high-level monsters. -The player may move the absolute value of the dice rolled. -The power of monsters are adaptable to the strength of the player. -constraint movement to choosing just one die of the ones thrown. -when a player loses to the boss, his/her dice is added to the boss’s dice pile, making it stronger. -mark the availability of monsters using the skulls (they’re cool!). Make the abundant ones weak, whereas making the unique ones (with unique die) more exclusive and harder to beat. -just pick one element of the game (boss fight vs PvP) and further develop that. -make monsters relatively easier to defeat -> ensure character progress. -make the battle system bit more asymmetrical -> the player who challenges the other have positive/negative consequences based on the outcome, however the player being attacked don’t have any consequences whatsoever. -players can see each other’s position in a board game, whereas in first person games you can’t. Think about how players move around the map: perhaps make it unpredictable / teleportable so that players can make the decision to move to attack people if they choose to. -The layout of the game might have to be changed entirely. -What is the end state of the game? Is it simply a matter of survival? What happens to the players that are killed, how do you mitigate their idle time? How can you allow them to still have influence on the game even after death? -How could you mitigate a polarizing effect when one person becomes too strong? How could you keep the game going without creating an extreme unequal power balance? Perhaps players can collaborate on attacking one particular player? -Put combat as the main appeal of the game. -Give a more concrete objective to the players within combat. =kill other players a certain amount of times? =occupy the throne for a certain number of turns. -Give a balance of strategy (perceived skill) and luck. =Steal (Thief) = steal a die / resource from the defender. -allow other players to intervene during the battle. -Make the combat outcomes more variable; add asymmetry between the attacker / defender. =if the attacker wins, he/she may choose an item of his/her choice from the defender. If the attacker loses, he loses a life. =if the attacker wins, he gathers resources. If he loses, he loses a life. The defender is unaffected by either outcome. -Player movement dictated by one specific die? Or roll several, and choose one from the pile. -Make the game object clearer; just one way to win! -The level progression represented by tiles is unclear and confusing. -The map design is too chaotic and unclear; no focal point of interest. -The variable combat mechanics (steal, stealth, etc) seem too confusing. -The absence of influence on the defender by the attacker seems a bit unrealistic, takes away drama. -The power ups seem to have no significant influence on the gameplay, and cards draw the attention to much too themselves rather than the dice. -Represent different power / weapons through different forms of dice (1d8, 1d12, etc.) rather than powerups and player abilities. -On a win, the attacker may steal an object of his/her choice directly from the defender. -Eliminate the various combat mechanics. -Eliminate the power up feature and the associated card-drawing mechanic. -Simplify the map layout to a centralized grid: a ziggurat with a peak. -Condense the map into a much more compact form to not only allow faster-paced gameplay but also rapid level progression. -Eliminate the level labels on the tiles to encourage multi-directional player movement. -deadlock in player engagement; too boring and repetitive. -no real incentive on reaching the throne vs. battling others. -it is more fun to battle players than monsters. -no real incentive to interfere in others’ battles. -lay down more concrete rules for players to follow. -make monsters easier to beat, and inflict no damage on players in losses. -given the movement restriction, give two dice in the beginning instead of one. -have the monster’s difficulty be represented by the number of tokens on the board. -perhaps randomly relocate the losers in battles, to avoid deadlocks. -resolve deadlock when a player is dethroned. -path of reaching the throne is too long / difficult? -change the difficulty / characteristic of the monsters on the upper layer. -the throne’s 1d20 is too polarized; either too strong or too weak. -The last player standing wins. -Introduce distinct dice (1d8, 1d4, 1d12) to give a better sense of ownership + incentivize other players to target each other for scavenging. -Regain health in case of emergency by sacrificing 3 followers. -In the case of more than 2 players on a given tile, the players may choose to team up in whichever way. -The player on throne rolls all of his/her dice along with the Lord’s Dice. -If the player rolls a double (or any matching numbers), the player can teleport to a tile of his/her choice within the same layer. -Introduce multiple entry points between layers to make accessing the throne easier. -Make lower levels more expansive to provide more room for movement. -Add non-combat plots where players can gather followers. -The map layout is too dull and repetitive, no incentive to move around to the outskirts. -Player alliance is often frustrating for the other players; the strength becomes easily unbalanced. -The special dice don’t really feel that special; it is too easily accessible from the beginning. -5 lives per player seems superfluous; frustrating for the King/Queen to eliminate other players. -There is still the deadlock in combat gameplay; too repetitive and long. -There is still no incentive for players to interfere in others’ battles. -Reduce the player lives back to 3. -The interfering player does not suffer any consequence as a result of the battle. -Disable the option for players to form alliances. -After an attack, the attacker may choose to move his/her character with a single dice roll. -The player may sidetrack / backtrack his/her steps as one sees fit. -Introduce more variations on the board game tiles: make the layout asymmetrical and create pocket tiles with freebie followers to incentivize players to travel to extremities of the gameboard. -Re-position the access points to the level above to be equidistant from each other. -Position the higher level monsters on the upper level as to clearly represent the level progression. -Make the board at least 3 times bigger to allow rooms for dices. -Retrieving dices on every monster battle is tedious. -Ensure all special dice are stronger than the normal dices. -Keep battle mechanics consistent between PvP battles and Monster battles. -The round-based battle mechanic is too repetitive and it’s more satisfying to throw all dice at once. -Keep the player’s influence on the monsters even at loss; sense of contribution. -Make the throne more accessible with less followers required. -Give more value to the followers token; perhaps make players with more followers stronger. -Perhaps you can make followers into additional characters that the player can control? -The player’s “soul” dice represent his health counter, recoverable by sacrificing 3 followers. Each player may only have 3 maximum “soul” dice at a given time. -A highest-to-lowest comparison battle mechanic, where each pair of dice is compared independently in the sorted order. The player either kills the monster and take its soul or spares it and keeps it as a follower for the pairs that he/she prevails. There is no consequence for loss against monsters. -In PvP battles, the winning player takes the die for the pairs that he/she prevails. If the loser’s die is his/her “soul die,” the loser loses a life. -In monster battles, the player must match the numbers of the monster’s dice in case he/she has a greater number of dice. The player may select whichever set he/she pleases. -In the case of a draw, the player with more followers wins. -If the player rolls a double (or any complete set of matching numbers), the player can teleport to a tile of his/her choice within the same layer. -The board grid itself is 2 times bigger, and more grid variations on the lower + upper levels to encourage different player movements. -Make the board more 3-dimensional, makes each layer visually separated. -More freebie follower tiles, represented by the skull token on the tile. -Monsters represented by the actual dices on the tile. -Only put 1d8, 1d10, 1d12’s on the tiles. -There is not enough value in followers once the throne is claimed. -Can the followers represent power in an another form? Accessibility? Combat advantage points? Only the players with the higher # of followers can challenge the current monarch? -The king/queen does not have enough influence over the players; the players are too hard to eliminate. -The number of dice possessed become easily out of control. -Gate the upper layer with follower requirements to give players more incentive to roam the lower layer. -What happens when the player loses in a challenge against the throne? -Perhaps the player must confront / defeat the guardian monster prior to claiming the throne. -Counting the dice on every monarch’s turn may be too troublesome. 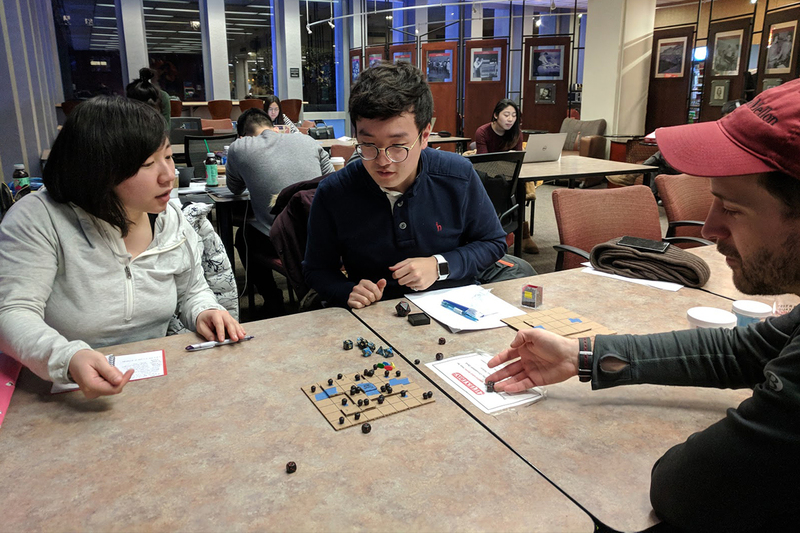 -In the case where the number of dice is at maximum capacity (7), the winner of a battle may choose to swap the opponent’s dice of his/her own choice with his/her own. She/he can also choose to take away followers. -When a player collects 10 followers, he/she can immediately claim the throne, bypassing the distance and the guardians. -The player may convert a soul die into a follower token if he/she is at maximum capacity. -A player may only be allowed to proceed onto the second level if he/she has 3 followers, and onto the third level if he/she has 5 followers. -The player may choose to use the movement steps in any creative way he/she wishes. -Adjust the entrances to the upper layers to encourage players to move through multiple monsters. -Make some of the freebie followers to be “deceiving,” inflicting negative influence on the player. -The game is a survival game and its main objective is to kill all other players as soon as possible. One may achieve this by: 1) PvP (Player vs. Player combat), or 2) claiming the power of the throne. -Each player is given 2 “soul” dices to start with. These are the player’s lives; once the player loses possession of these, he/she is permanently eliminated from the game. -The maximum number of dice a player may possess at a given time is 5. If it exceeds this capacity, the player may choose to convert a die into a follower. -At the beginning, all players roll their dice to determine which player goes first. The one with the highest sum wins. -Each player’s turn consists of: 1) Movement, and 2) Combat. 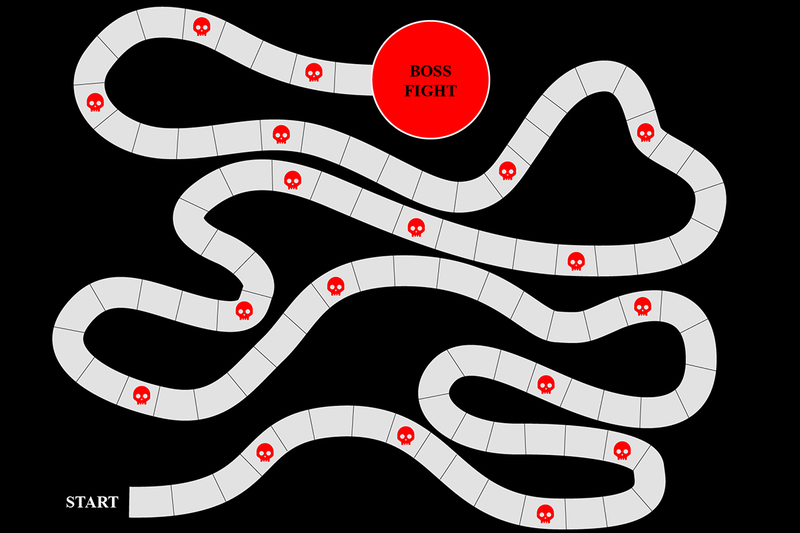 If the player is not able to engage in a combat, the turn is over. -The player may choose to move the absolute (not range) value chosen from his/her dice roll. This may include sidetracking / backtracking. -The player may bypass the monster tiles that fall within his/her path, if a freebie follower falls within along the line of path, the player may claim it without stopping on the tile. -The player may teleport to a desired location on the same level at the cost of 2 followers. -The player may move to the second level if he/she is in possession of at least 3 followers. He/she may move to the third level in the case of at least 5 followers. -The player may claim the throne immediately, bypassing the guardians, in possession of 10 followers. -The player may only advance to the next level through the tiles marked on the map. -On a “freebie” follower tile, the player may collect one follower for free. -On a monster tile, the player has to engage in a battle with the monster. In which he/she is victorious. Same rule apply for PvP. -On the pairs the player is victorious, the player may choose to: 1) Slay the monster and claim its soul die, or 2) Spare its life and add to the player’s pool of followers. -The monster’s strength is sequentially deducted through partial victories. -Other players may intervene in the current player’s battle with the monster. -The players must confront the guardians on the third level prior to gaining access to the throne. -The player on the throne may add the “Ruler’s Die (1d20)” to his dice pile. He/she throws the dice pile at every turn, requiring the other players to throw as well. The players with a sum higher than the Ruler’s sum is spared, whereas a sum lower results in a loss of life. -When the player on the throne is challenged and defeated by another player, the ruler is dethroned and sent back to the starting point. Based on my familiarity with the board games currently on the market, I may list the item at a starting retail price of $15, not including taxes. The material contents of the game (plastic tokens, dice, and game board) are low-cost industry standard products that can be bought in bulk from their manufacturers. The consumers will find this price reasonable because: 1) each round of game may round around 30 minutes ~ 1 hour, 2) replayability with different people makes it a reusable game, 3) caters to player range between 2 and 4, catering to various group sizes, 4) fairly simple and intuitive gameplay caters to both children and young adults, and 5) the competitive and yet social components make it an ideal party game.